While you are struggling with drug addiction, there is no need to do so alone. 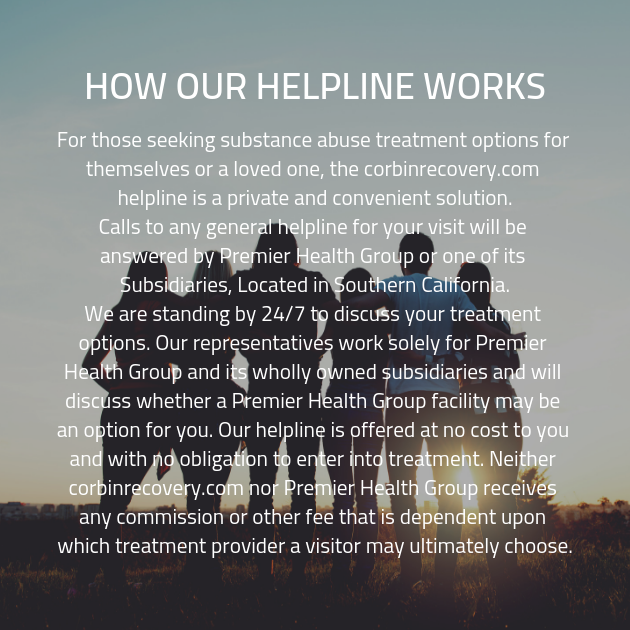 You can overcome this, you just need the support and care of compassionate addiction specialists who will help you beat this debilitating disease. What you need is personalized, structured treatment that will be designed around your needs and comprehensively altered to continuing meeting them through treatment and beyond. No two people are alike, their addictions are surely different, and their treatments should be as nuanced as they are. To full break free from this, you need treatment that will bend to you and your situation, not the other way around. The professionals at Corbin Recovery will not know how to help you if you don’t tell them the truth about yourself and your condition. We can’t do this, however, unless you are completely open and honest with us. You will only be hurting yourself by not cooperating with treatment. Furthermore, the clients who you will work with during group therapy will not be willing to help you if they know you are not committed to treatment and recovery. They will not want to go out of their way for someone who will go out again and immediately relapse before trying. Commit to treatment and you’ll see how much easier it is to beat this. Dishonesty also hinders the overall environment of the community our addiction recovery center cultivates. We aim to foster an atmosphere of trust, support, acceptance, and assistance, and we can only do so if everyone is being completely honest and transparent. While you are going through group therapy, the empathy and support will inspire and motivate you, but only if you are committed to being open, candid, and truthful. To be fully honest, you must overcome denial. You need to admit to yourself and others that you have a chronic brain disease you cannot control or beat on your own without assistance. This is okay. Eliminating denial is perhaps the first step to overcoming addiction. Come to terms with your condition and accept the help you need and the support you deserve.